Twitter (TWTR) – a stock I have always looked at with disrespect, because it does nothing, it creates nothing, it delivers nothing. It is worthless. It only allows people to waste their time online. That was what I thought about this stock and many times I told myself that I would never invest in a company like this. Although everything I said about Twitter above hold water in my opinion, I changed my mind about investing into this stock. Why? This stock showed resilience in today’s market and continues growing. It is considered one of the strong, bullish stocks. Although it fluctuates, it continues trending up. How is that possible? Let’s take a look at a few things – business model and expectations. How Twitter makes money when it makes nothing, builds nothing and the only thing it does is allowing users to waste their time online messaging about everything and nothing? Advertising. Yes, that is the only income stream this social media giant can offer to investors. I still feel disrespect to this stock, what about you? What Makes Twitter a strong stock in this market? It is expectations of investors and a massive growth of the company. Yes you have heard me correctly – a massive growth. It will not last forever, but until it ends, let’s take advantage of it. Let’s take a look at a few numbers. When Twitter started in 2006 it hosted approx. 20,000 tweets per day. In 2010 it was 50 million tweets per day, and today, just FIFA World Cup caused users to send more than 650 million tweets. Enormous growth in user base and a revenue potential. This growth in user base and revenue potential paid off itself. In the second quarter of 2014 Twitter reported $277 million in revenue – a 129% increase in growth. Twitter is becoming a more international company than domestic. 77% of all users reside outside the United States. Recently Twitter announced that it had doubled their advertising in Europe itself. All these news and efforts are pushing the stock resiliently higher in today’s market. I still wouldn’t invest in Twitter for a long haul. I still am not convinced that I would ever fall in love with the business model of the company. But from a short term perspective, Twitter presents a great short term option trading opportunity. To take advantage of this opportunity I opened two trades recently. 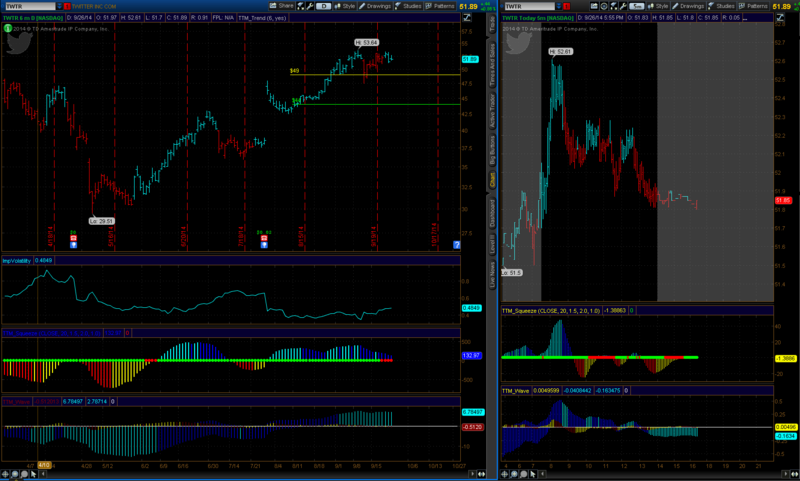 Both were bull put spreads speculating that Twitter would stay above my short strike in upcoming three weeks. The first trade is a short one. It will expire next Friday (October 3rd, 2014) and the second trade will expire on a regular option expiration day – a third Friday in October. The first trade was selling a bull put spread made of weeklys options. When creating a spread, you sell a short put (or call) and buy a lower put (or higher call) for protection. If the stock stays above the lower short strike (or below the short call), the spread expires worthless for a full profit. If the stock drops below your short put strike but stays above the lower long put strike, you will see a partial loss or partial gain (it depends where the stock lands, if still above your breakeven point or below it). If the stock lands below both of your strikes, you will end up with max. loss. The trade executed on Thursday last week and I collected $100 in premium. The trade is set to expire next Friday. The trade also executed on Thursday last week and I collected $60 in premium. The trade is set to expire the regular third Friday in October. If any of the trade turns against me, I will most likely exit it. I will not be rolling those trades. If you are interested in receiving an alert for the trades I am about to open myself, you can subscribe to a newsletter to receive a trade alert prior to entering it myself. I am not a fan of TWTR as an investment. It feels like the poster child of the idea that metrics and profitability just doesn’t matter. At current valuations it would have to make how much to even have a P/E of 100?